My journey to study Nutritional Therapy started for me when I was 18 and living in Spain, away from home for the first time. A row of tequilas was my pre-drinking tipple and my kitchen cupboards were bare apart from a few packet of crisps, just incase my hangover wasn’t at code red and I could stomach some salty snacks. I am happy to say that this life binge was short lived, but after finishing university and going back home my body made me pay the price. I spent the next few years feeling sluggish, in pain, with a low mood even though I ate what I thought was a balanced diet, and exercised. I had a regular date with the doctor and each time he fobbed me off with more painkillers for the headaches or nausea tablets for my growling stomach. I was even offered anti-depressants, which I immediately declined. After almost a year I broke off my relationship with the doctor, as it just wasn’t working, and it was definitely him not me. I then sought out a Nutritional Therapist who suggested a food intolerance test. My test came back flagging gluten, dairy and eggs, and whilst I was relieved to finally have an action plan, my first question was ‘HOW AM I GOING TO EAT?!’. It was a shock to the system but with the help of my Nutritional Therapist, a lot of research and self-experimentation (and failed recipe testing), I have slowly refined my diet and started to heal my body. My own healing and the amazement of what food can do, fuelled my want to learn more about this amazing subject, which lead me to enrol with the Institute for Optimum Nutrition. I am simply fascinated at what the body is capable of and how harmoniously it can function when provided with the correct fuel. Along side this, I have a passion to help people just as I was helped, so hopefully one day I can inspire someone, just as I was inspired. Sarah is currently studying with the Institute of Optimum Nutrition (eNTDC) and has just started year two of the Nutritional Therapy Diploma Course after first completing the Science Access Course. Welcome to the September issue of BANT ENews, this month is all about Practice Management. A little bit of a head start for our newly graduated members who are taking their first steps as Registered Nutritional Therapy Practitioners and some helpful hints and tips for our more seasoned members. Included in the issue are an article on ‘How to Organise a Retreat’ from our Communications Director, Daniel O’Shaughnessy, a review of the practice management software tool Cliniko and a brand new ‘Spotlight on the BANT Website’ feature, to help you get the most of all of the information BANT has developed/centralised especially for you. Access the BANT news here. Welcome to the September issue of BANT ENews, this month is all about Practice Management. A little bit of a head start for our newly graduated members who are taking their first steps as Registered Nutritional Therapy Practitioners and some helpful hints and tips for our more seasoned members. Included in the issue are an article on ‘How to Organise a Retreat’ from our Communications Director, Daniel O’Shaughnessy, a review of the practice management software tool Cliniko and a brand new ‘Spotlight on the BANT Website’ feature, to help you get the most of all of the information BANT has developed/centralised especially for you. BANT read with interest the widely publicised study, published in JAMA Pediatrics, that found that “caesarean delivery can increase a child’s risk of obesity into adulthood, compared to their siblings who were born naturally”. The hypothesis put forward by the study’s authors is that the higher risk of obesity observed may be due to the difference in exposure of beneficial gut bacteria (gastrointestinal microbiota) experienced by babies born by c-section versus those born via the birth canal. Tim Spector, Professor of Genetic Epidemiology at King’s College London and a consultant physician at Guy’s and St Thomas’s Hospital stated on behalf of BANT: “This new study from Harvard of 20,000 births confirms 6 previous observational studies showing C section babies have a 15 percent increased risk of obesity. Other studies have shown increases in allergy. A lack of natural gut microbes is the likely cause”. A study by Shen TC et al., (2016) recently highlighted that a diet a person consumers over a year is closely linked to the composition of their gut bacteria. For example, a person who eats a carbohydrate heavy diet (pasta, rice, potatoes and refined sugars) is more likely to have an abundance of the Prevotella bacteria, whereas a person who has a more protein (meat) based diet will have a preponderance of Bacteriods. Diet, therefore, is vitally important to beneficial bacteria. Registered Nutritional Therapists are acutely aware of how important the gut, and its resident bacteria, is both in terms of obesity risk, but also in relation to other health conditions and are able to provide individualised client recommendations to support gut health. BANT registered practitioners are insured to recommend supplements such as probiotics and prebiotics where needed. This is after thorough assessment based on clinical practice framework which takes into account test results. 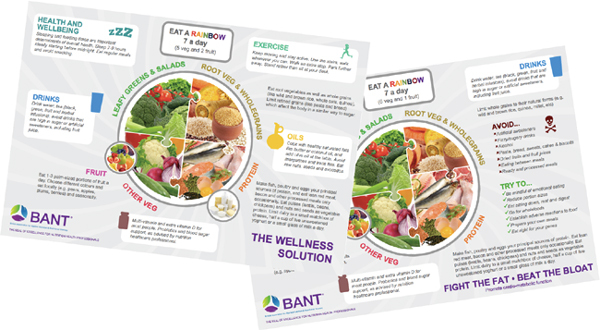 BANT Registered Nutritional Therapists are uniquely trained to prescribe food supplements with caution, assess supplement quality, know supplement interactions with medications and appropriate dosing for the individual client. Shen TC, Chehoud C, Ni J, Hsu E; Chen YY, Bailey A, Laughlin A, Bittinger K, Bushman FD, Wu GD (2016) Dietary Regulation of the Gut Microbiota Engineered by a Minimal Defined Bacterial Consortium. PLoS One. 13;11(5):e0155620. doi: 10.1371/journal.pone.0155620. eCollection 2016. BANT welcomes the news that the lead researchers of an independent review by the Cochrane research body (the absolute gold standard) have announced that taking Vitamin D supplements in addition to asthma medication appears to cut the risk of severe asthma attacks and cut the rates of steroid treatment. BANT was disappointed by the Scientific Advisory Committee on Nutrition’s (SACN) recent recommendation to Public Health England (PHE) that vitamin D supplementation could only be recommended for bone and muscle health, despite all of the scientific evidence to the contrary. Did SACN not find any correlations because of its own criteria? “Clinical advice to high risk women (obesity; darker skinned and reduced exposure to sunlight) is outside SACN’s remit”. BANT feels that ignoring thousands of animal, in vitro, genetic, and epidemiologic studies that have linked vitamin D deficiency with the development of autoimmune disease and other conditions is a missed opportunity and questions how PHE plans to measure the damage done to those who are not benefiting from appropriate governmental advice. BANT Chairman Miguel Toribio-Mateas said: “Vitamin D has traditionally been known for its role in bone metabolism, but emerging evidence suggests a much broader role for vitamin D in immune regulation. In fact, vitamin D deficiency has been associated as a contributor to the pathogenesis and severity of diverse autoimmune disorders, from autoimmune bowel conditions like coeliac disease to rheumatoid arthritis, lupus, and multiple sclerosis; some of the main reasons individuals seek advice from our members. There is consistent scientific evidence that in some people with variants in vitamin D metabolism and vitamin D-receptor genes the ability to convert vitamin D into a usable form is compromised meaning, that these individuals may remain deficient despite supplementation. Thus knowing about these genetic variants would allow an appropriately trained practitioner to provide a vitamin D protocol that is tailored to these individuals’ needs. As shown in clinical trials conducted in a variety of countries around the world, a simple blood test that measures serum 25-hydroxyvitamin D confirms that even when vitamin D is supplemented at modest levels, like the 10μg (400IU) proposed by Public Health England, some people will continue to have inadequate vitamin D levels. Additionally, some of the foods that are traditionally fortified with vitamin D, like flour made from milled cereals, used for bread-making and in most commercially available breakfast cereals, are also associated with higher levels of diet-driven inflammation, known as Dietary Inflammatory Index. Vitamin D is a fat soluble vitamin whose primary source is sunlight. Very few foods contain vitamin D, hence the recommendation for supplementation. Food sources of vitamin D include sardines, cod liver (available as a pate that can be used as a savoury spread), tinned tuna, liver, eggs. However, please note that food sources are notoriously poor. With regards to fortified foods (the equivalent of taking a supplement that’s been added to your food) like orange juice, breakfast cereals BANT considers that these may be useful for those individuals who are not able to eat any other sources of vitamin D or to supplement, but strongly advises to read the labels and check for sugar content, both natural sugars and added (sucrose and fructose in many cases) as well as other undesirable ingredients. Both forms have been regarded as equivalent, based on their ability to combat rickets and, indeed, most steps involved in the metabolism and actions of both forms are identical and both forms effectively raise serum 25(OH)D levels. However, studies have shown that high doses of Vitamin D2 are less potent and thus BANT recommends supplementing with Vitamin D3. RNT’s are able to provide individualised recommendations. BANT registered practitioners are insured to recommend supplements where needed. This is after thorough assessment based on clinical practice framework which takes into account test results. BANT Registered Nutritional Therapists are uniquely trained to prescribe food supplements with caution, assess supplement quality, know supplement interactions with medications and appropriate dosing for the individual client. Back, even bigger and better than last year, the Nutrition Theatre, sponsored by Wiley’s Finest, will offer 17 fantastic sessions where you can discover the very latest consumer trends, research, developments and products from the nutrition world. Taking place at Olympia London, later this month on 24-25 September, camexpo’s dedicated Nutrition Theatre (sponsored by Wiley’s Finest) will run 17 CPD-accredited sessions across two days. Confirmed speakers include leading nutritional experts like BANT’s Miguel Toribio-Mateas, Dr Marilyn Glenville, Gudrun Jonsson, Dr Robert Verkerk, Antony Haynes, Umahro Cadogan, Dr. Armin Schwarzbach, and Nadia Brydon. Digestive health, vitamin K2 deficiencies, superfoods, childhood obesity, brain health, natural alternatives to sugar, and the benefits of the Mediterranean diet are just some of the hot topics under discussion for 2016. Dr Sarah Brewer, Dale Pinnock, Christine Bailey, Professor Robert Thomas, and Elizabeth Butler will also be focusing on diet and nutrition in their Keynote Theatre sessions. See the full Nutrition Theatre line-up here and the Keynote Theatre line-up here. Whilst Vitamin D might be getting all the press lately, the multivitamin is still far and away the UK’s top seller, according to the latest data from Euromonitor International. Fish oils/omega fatty acids, herbal/traditional dietary supplements, glucosamine, vitamins C and B, and probiotics also appeared in the list of top ten bestsellers. “I think it is important for everyone to have a multivitamin and mineral, as it forms the foundation of any supplement programme. Also a lot of people are ‘overfed and undernourished’, so a multi gives them a broad range of valuable nutrients,” says Dr Marilyn Glenville. Euromonitor’s report shows that UK sales of vitamins and dietary supplements reached £879.3m in 2015 (up 1.7%). Increasing health awareness among UK consumers is fueling that demand. Of course, there is no one size fits all approach when it comes to nutritional health and wellbeing. Providing personalised diet plans, including beneficial supplements (when necessary), is a subject that many nutritional therapists and practitioners are already well-versed. And those that can be quick to adapt to the latest trends, innovations and research have much to gain and a visit to camexpo will provide you with all you need. camexpo’s 200-strong exhibitor list features some familiar VMS suppliers previewing their next wave of new products for the autumn/winter season. Among them are Pukka Herbs, A Vogel (Bioforce UK), The Really Healthy Company, Synergy – The LP Partnership, Nucleotide Nutrition, Nature’s Plus, Good Health Naturally, Wild Nutrition, The Natural Health Practice, Hifas da Terra, Living Nutrition, Bio Pathica, Renew Life UK, The G&G Vitamin Centre, Bionutri, Biodane Pharma, Rio Trading Company Health, Vega Nutritional, Cell Nutrition Quinton, Bestcare, Nutri-Globe, Chris James Mind Body, Bio-Kult, Lepicol, and Wiley’s Finest UK. View the Full Exhibitor list online here. “camexpo is the most comprehensive and delicious learning and professional development feast for CAM practitioners in the UK. I love the fact each year camexpo just keeps getting better and better! I am increasingly impressed by the diversity of practitioners who come to camexpo to develop their knowledge and skills. It’s a privilege to be able to speak to a group of people, who are on one hand insufficiently recognised by society, and, on the other hand function at the coalface of health, providing services that consistently transform lives for the better,” says popular show speaker Dr Robert Verkerk, founder of Alliance for Natural Health International. New for 2016, all workshops and seminars at the show are now CPD-accredited.